This story is intelligent, witty and sharply written, highlighting the spectrum of grey that exists between the simple poles of good guys and bad guys, good deeds and bad deeds, and deeds born of good intent and deeds born of malice. 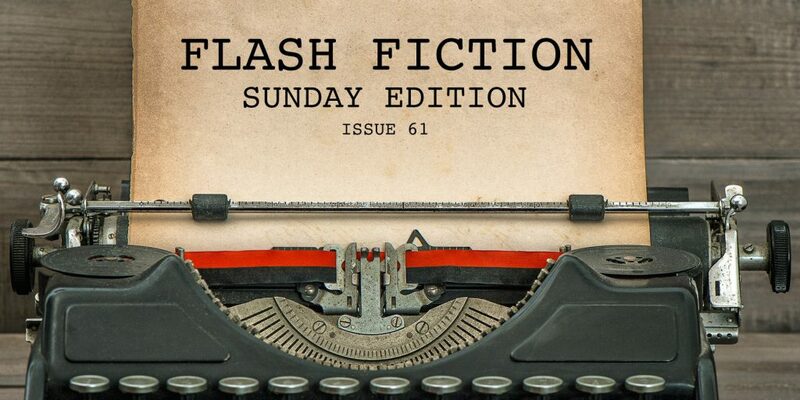 This story also introduces a theme for this *Sunday Edition*: it was National Flash Fiction Day last month, and I was involved in the organisation of events in Bristol. K M Elkes ran a workshop and gave a reading of this story on the day. A wonderfully and carefully crafted story woven through with observation and metaphor. This story appeared as part of the FlashFlood, a tireless and rich stream of flash fiction that appeared from midnight to midnight on National Flash Fiction Day. On the day, Tim Stevenson also gave a reading of this story in Bristol. I love how this story picks through Bristol’s specifics and its past, mixing them in with the imagination and sureness of childhood imagination. This story was read out by an actor on the Bristol Flash Walk on the morning of National Flash Fiction Day. This story placed second in the National Flash Fiction Day micro-fiction competition. It demonstrates a deep understanding of how to work the form and the title (which I have truncated) to achieve a one-word story. It is also (very) funny. I was one of the competition judges. This story stood out as an example of the flash form. Ingrid Jendrzejewski also had a story read out during the Bristol Flash Walk and another story of hers appeared in the NFFD FlashFlood.